Liners – GPM International Inc.
GPM ceramic liners are designed to use in harsh environments. 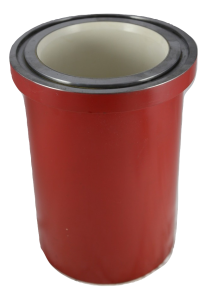 Liner sleeve made from ceramic/zirconia material extends the service life than regular steel liners. With this unique material, service life can reach more than 4000 hours. This results in less oil rig downtime and offers more efficient budget cost per operating hour, also reduces piston wear and water consumption for lubrication. metal, inserted into the forged steel hull at full tension. The bore hardness is 60 to 67 Rockwell C scales, while the hull has a higher tensile strength of more than 90,000 psi, liners with these high quality characteristic can withstand mud pressure up to 7,000 psi and rated to match the pressure rating of the pump per liner size with more than 800 hours of working life under normal environment.